Welcome to the Waxed Linen Blog Hop kindly and most ably hosted by the Diana Ptaszynski of Suburban Girl Studios. I was even later than usual getting my pieces done for this hop to the point where I was still finishing up at 2am this morning so I had to keep them fairly simple. That’s one of the things I love about waxed linen though – it’s very easy to put something simple but eye catching together very quickly. My first piece is a braided strung bracelet with a lovely pewter button clasp and heart charm from Mamacita Beadworks and rustic blue/grey seed beads from Smitten beads. The tails have been finished with some tiny pewter beads I was given as part of a bead soup four year ago. Very simple but the kind of thing I wear a lot. My second piece is a reprise of a necklace I made last year with wire wrapped beads but this time I used double strands of waxed linen to string these lovely Czech glass beads – again from Smitten Smitten Beads, The ceramic heart focal is by Karen Totten of Starry Road Studio and the bronze text connector is by THEA elements – that’s me! And finally I whipped up a pair of five minute earrings using some red ceramic beads from our host Diana and some cream ceramic discs by me. 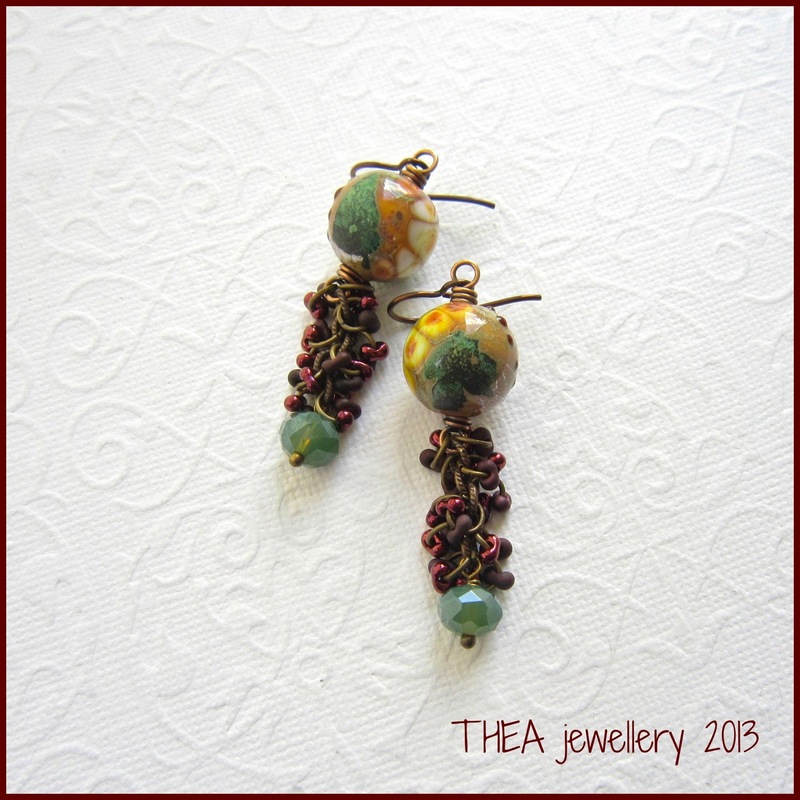 A scrap of linen, a few copper accent beads and some ear wire and that’s it done…I frequently make earrings like these when I’m about to go out and find I have none to match my outfits. So those are are a few ways to use waxed linen and I’m sure the other participants will have demonstrated many more so I hope you will join up on the hop using the links below and many thanks to Diana for hosting this hop. of my flower focal sets, one of Caroline’s bird focal sets and a length of sari silk courtesy of Claire from Smitten Beads. As always I left this until pretty much the last minute and very stupidly forgot to take pictures of my individual beads…how many times is that now…? Anyway, for my first piece I decided to work with Caroline’s focal pendant set of a pretty china painted bird and leaf. I started by trying to think of a way to use them independently rather than the set they came as but they really are made for other and look so good together I decided to just go with it. I wired the bird onto a large disc bead to act as a kind of bird table and wired another loop underneath. 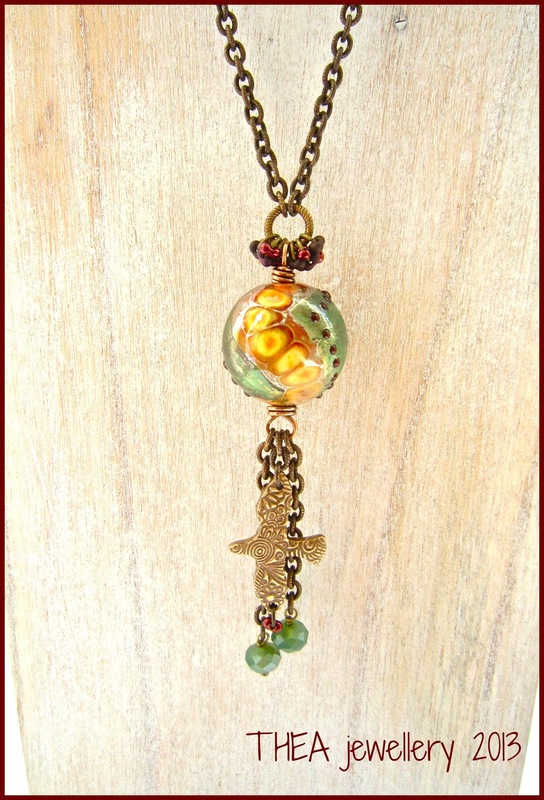 To this I added the leaf element together with one of my bronze flower charms and some Czech glass flower dangles. I wanted this to be a long necklace and my natural instinct for this style is to let the focal group do the work and keep the rest very simple but as the host just using a chain for a challenge piece felt like a bit of a cop out so some sort of embellishment was needed. In the end I decided on purple Irish linen woven through the chain and threaded with pearly seed beads. I love the finished look – subtle and elegant but a bit more eye catching than chain alone would be. The necklace is completed with hand forged brass ‘S’ clasp and a couple more Czech glass dangles. Because we put extra sets up for the challenge I didn’t actually get one of my own focals from the original batch and decided I would take something from my stock. Of course, by the time I got around to it I didn’t have a lot to choose from so my focal is more neutral in colour than the other pieces and I was concerned that it looks a bit more autumnal than spring like. However, since any spring flower that wants to blossom in my garden this year has had to battle it’s way through the untended remnants of last autumn, it doesn’t seem wholly inappropriate…! Another of Caroline’s birds has found it’s way into this necklace along with one of my bronze flower connectors which acts as a focal clasp. 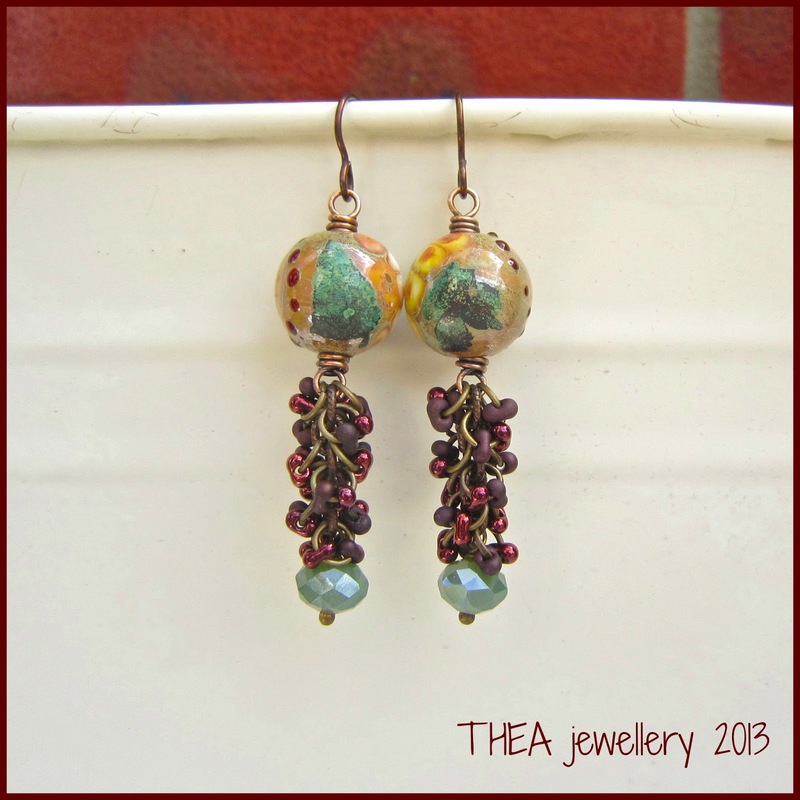 The focal elements are accented with ivory lampwork glass, Czech glass and rustic seed beads. I love the earthiness of this and think it could actually be worn at any time of year. As you can see, I have quite a stash of Caroline’s bird beads so I sat a couple of these in the centre of hoops of 14gauge bronze wire. Starting from the centre and working outwards I worked a square knot around size 5/6 seed beads. The wire hoop is connected with simple loops and the silk strings tied of and left as tails to give bangles with a fresh fun look… I think I could get addicted to making these! So there you are then…I hope you’ve enjoyed seeing how this challenge inspired me. I’d like to say a huge thank you to everyone who has taken part in this challenge and made it so much fun, and to Caroline and Claire for joining me to make it happen in the first place. I hope now you’ll join me on the blog hop to see the rest of the wonderful designs…just click on the links below to see more. All these pieces will be available in my Etsy shop shortly but please let me know if you are interested. 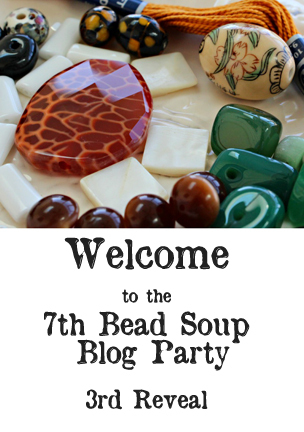 Welcome to the third and final reveal of the 2013 Bead Soup Blog party. 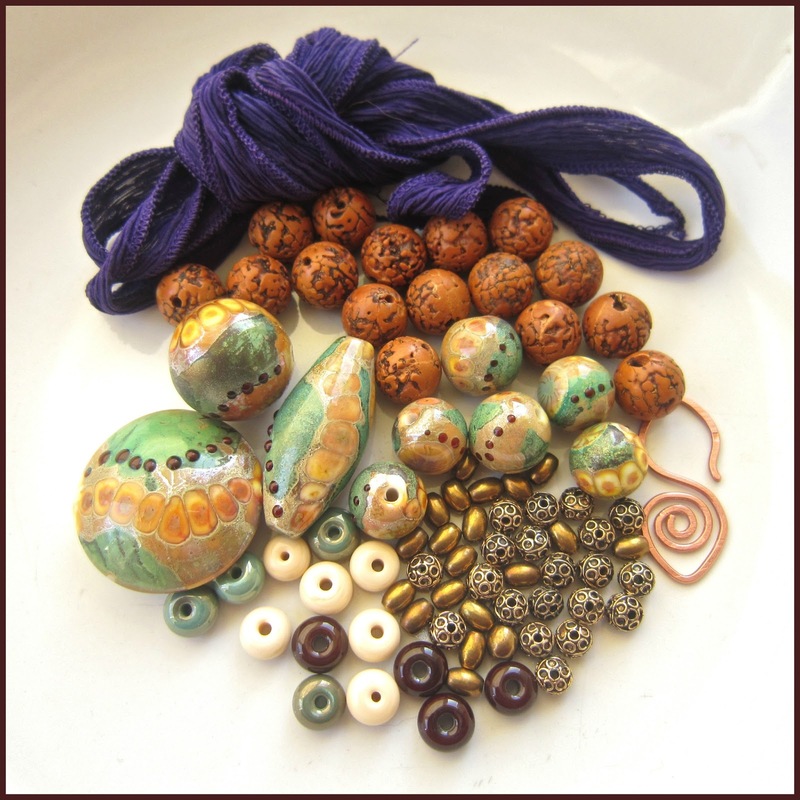 Here’s a reminder of the fabulous soup mix I received from my partner Silke Grober from Germany who, as you can see makes gorgeous lampwork beads. Silke was incredibly generous sending me not one, but three of her own focals as a matching set and some spacers along with some lovely brass and Rudraksha beads – thank you so much Silke for sending me ingredients that were such a pleasure to work with. I certainly had plenty to play with so I’ll get on with it and show you what I made. 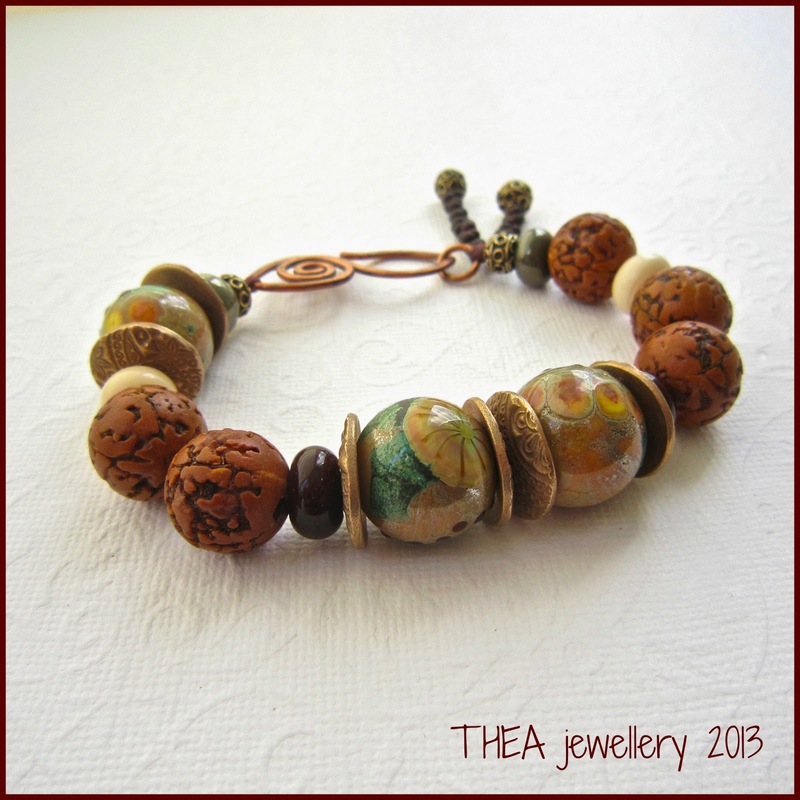 I love the earthiness of Silke’s beads and they remind me a little of aerial landscapes, autumn seasons and for some reason vineyards. The first piece I made is this necklace using the ‘elongated bicone’ focal (not sure what the proper name for this shape is) set on a hand made bronze pin and bail. I particularly like the dark plummy accents on the focal and wanted to try and pick this up in some way so I dug out some lovely matte peanut and seed beads from Smitten Beads and strung them with some of the accent beads from the soup. The Rudraksha beads and the gorgeous brass filigrees add a lovely warmth and although It’s a fairly traditional design I think it’s very pleasing to the eye. 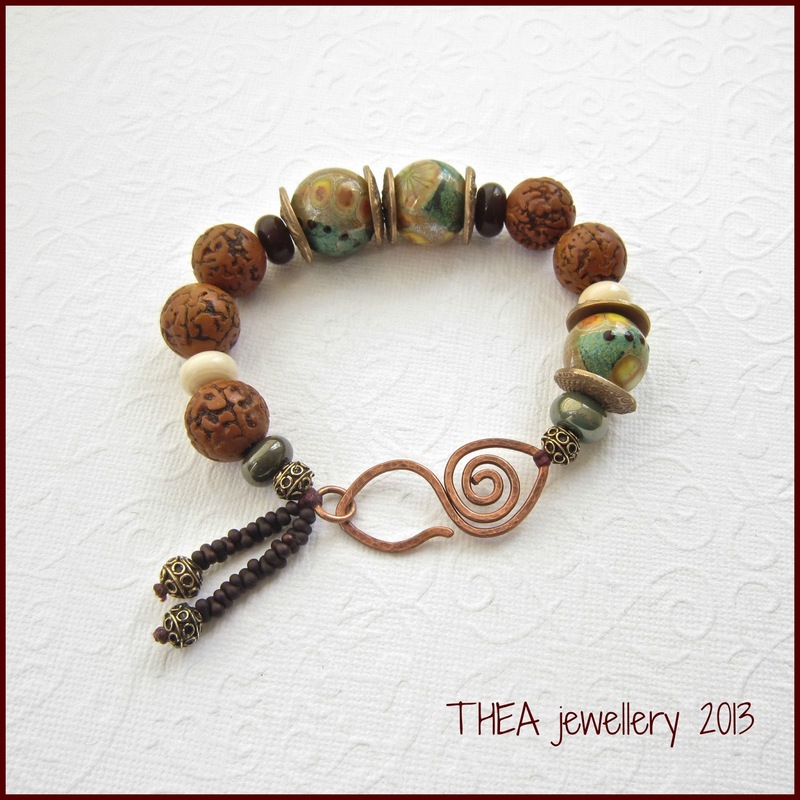 Next I wanted to do something which incorporated the copper clasp Silke had made which I felt was crying out for a bracelet. I decided to go asymmetrical and fairly casual and went for Waxed linen for the stringing material, randomly adding beads from the soup mix along with a few of my own bronze discs. I finished the cord tails off with some more of the peanuts beads and that was it – simple but effective. For my next piece I chose the round focal bead which is probably my favourite but it is rather large so it took some thinking about. In the end I decided on a very long necklace with simple accents to show of the full beauty of the focal. The chunky Vintaj chain is interspersed with lovely sea green crystals (again from Smitten Beads) and both these elements are repeated as dangles below the focal. 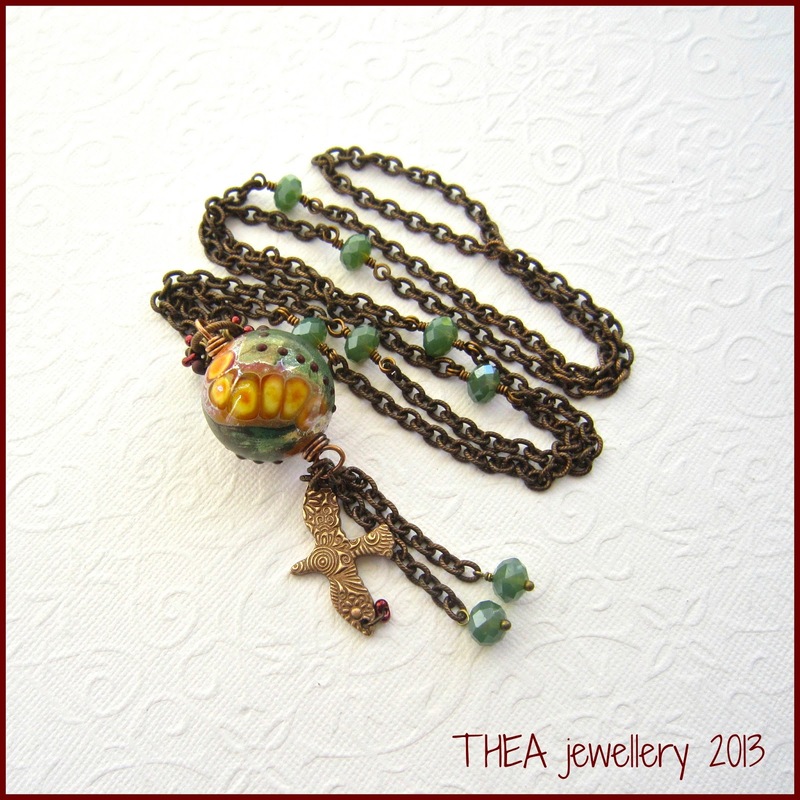 I also added one of my bronze flying birds as a dangle and a few matte and shiny peanut beads to the bail to highlight the colour on the focal. This piece did prove somewhat difficult to photograph clearly but I hope you can get an idea. Last but not least, I used a couple of the smaller lampwork beads to make some earrings which will go with any of the other pieces. 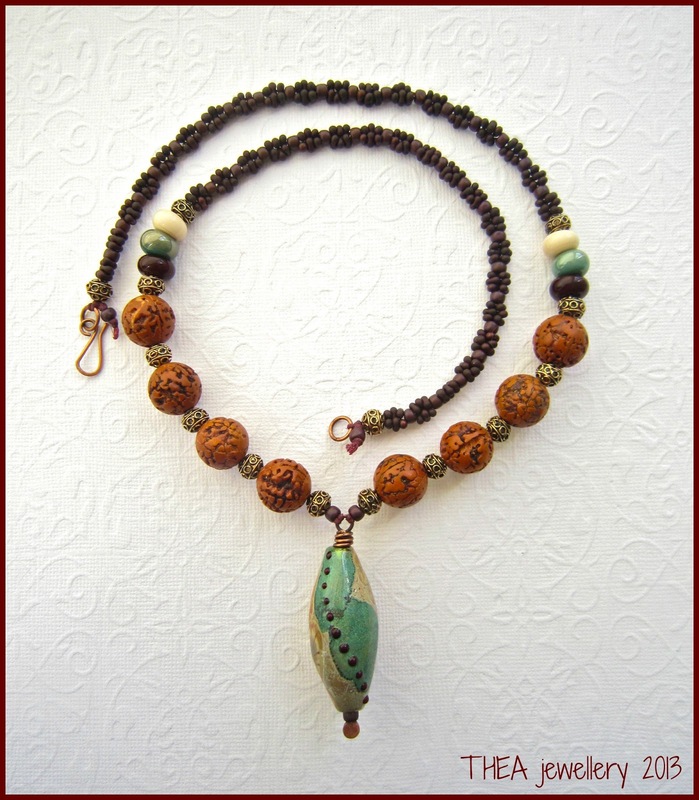 The beads are wrapped in bronze wire with a length of chain suspended from the bottom. 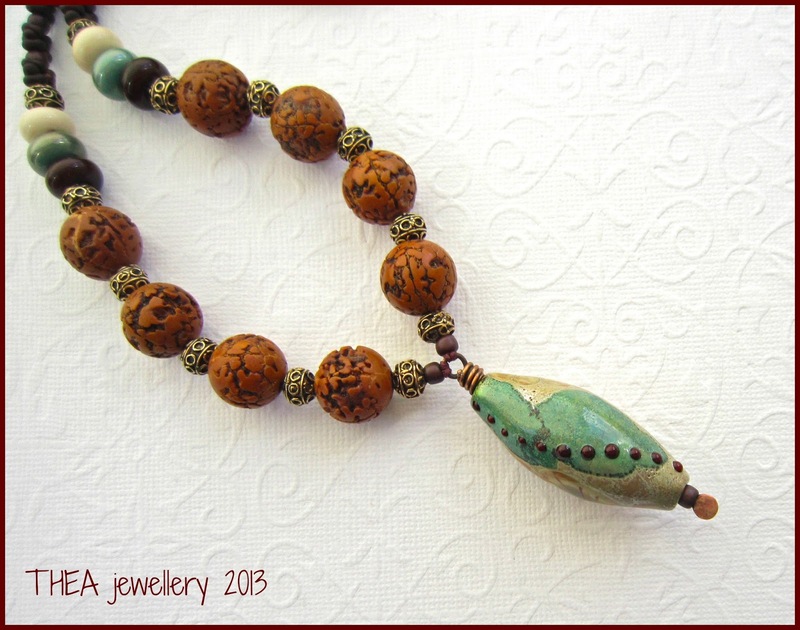 I added some more peanut beads ( can you tell I rather like these peanuts…) to small jump rings and attached these to the entire length of the chain and finished off with the sea green crystals. These have a lovely sense of movement and texture and I liked them so much I’ve made some similar styles since. All pieces now in my ETSY Shop. 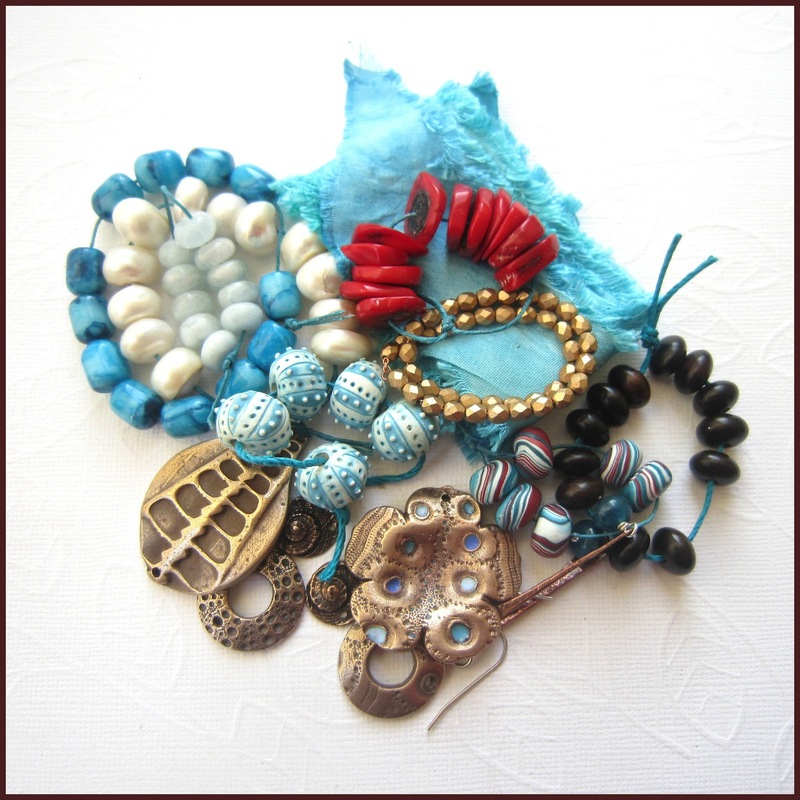 I still have 1 focal, the silk and a few beads left so there will be more to come but for now that is my serving of bead soup – I’m so excited to see what Silke has done with the beads in the picture below which I sent her and I hope you will pop over to her blog too and take a look. I’d also like to offer a huge vote of thanks to Lori Anderson and her helpers for organising yet another epic event and being a huge inspiration to us all. To see the designs made by all the other participants just use the links below and start hopping.